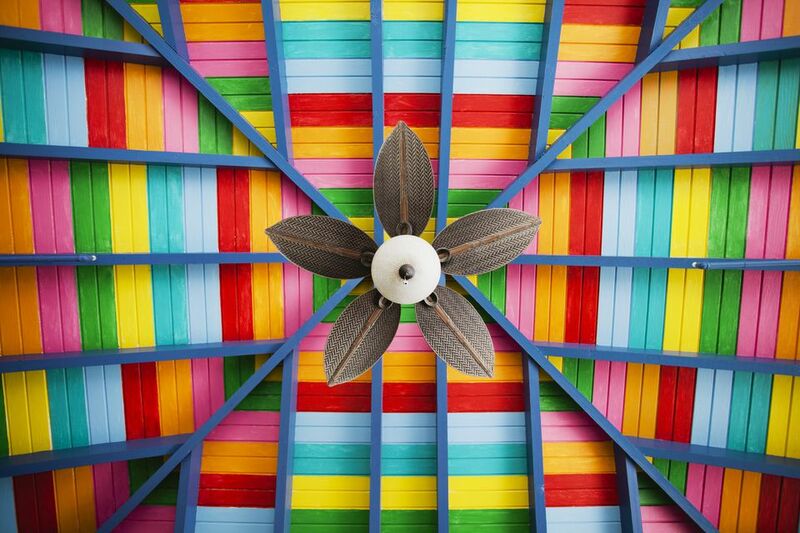 You’ll be amazed how effective a ceiling fan can be in cooling off a room. You may also be surprised that they can also be used to direct heat back down in the winter. That may be why ceiling fans are so popular and seen in many homes and apartments as standard appliances. Once you picked the style, color, size and various features you want in your ceiling fan, installing it is actually fairly straightforward if you have basic electrical skills. Ceiling fan assemblies can be very heavy, 50 to 70 pounds is not uncommon. When you consider the mass of the motor, size, and number of fan blades and the glass globes used on some models of fans with lights you can see how the pounds add up. This weight coupled with the vibration that some fans generate cause significant dynamic loads on the electrical box to which the fan attaches. As a result, the NFPA 70: National Electrical Code® and most local electrical codes that reference it require the use of a ceiling fan-rated electrical box that can handle the weight and motion placed on the box. A ceiling fan-rated electrical box will be marked and labeled as such usually rated to support a 70-pound weight. Ceiling fan boxes in new construction will use a saddle box or braced electrical box for support. Retrofitting into existing ceilings will require a special retrofit brace and box assembly. When retrofitting a fan into an existing ceiling light fixture box it may not have adequate support. If you go ahead and use the box anyway because there is no way to reinforce it, the fan will potentially wobble and the tightness of the electrical box to the structure can loosen, creating a dangerous situation not meeting electrical codes. First, shut off the circuit at your power panel that will connect to the ceiling fan. Next, if you are retrofitting a fan into an existing box or using wire installed in the early 1950s or earlier, it probably uses cloth-sheathed rubber insulated cable. This cable is prone to cracking of the rubber insulation. If you are installing a standard light fixture (as shown in the photos above) or removing the box to install a code compliant fan-rated box, the insulators may start to crack. In that case, you will need to repair damaged wire insulation. Note: If you are installing the fan into a new ceiling with new wire you can disregard this step of repairing the wire insulators. Now that we know the ceiling box can support the weight of the fan and the wiring is safe, let’s get to the installation. Open the box and remove the components. Before beginning, check for any damage such as to the glass globe (if lighting is used) and ensure completeness of all parts. Make sure you read the instructions thoroughly for any unique installation requirements not covered under this tutorial such as wiring options. Depending on the specific instructions found in your ceiling fan kit, there will be some kind of mounting bracket that fastens to the electrical ceiling fan-box. Mount the support bracket using the screws provided in your kit. As you mount the bracket, guide the electrical wires through the hole provided that allows the wires to pass from the box through the bracket. Make sure they do not pinch. Once the mounting bracket is securely fastened to the ceiling box, place the fan motor on the bracket hook using the hole specified in the instructions. This step allows the heavy fan motor to be supported until you complete the wiring connections in the next step. Note: If your ceiling fan model does not have a supporting hook on the bracket it's advisable to support the weight of the fan assembly to the bracket with a plastic zip-tie until the wiring connections are completed. Next, it is time to wire the fixture for power to the fan motor and for the light, if appropriate. When you perform this step you'll understand why the previous step of relieving pressure on the wires is so important. The model of fixture you have and how you want it switched will determine how it gets wired. See your instructions for details on specific wiring requirements. However, in general, if you want the light and motor controlled by the same wall switch, wire it as shown. First, connect the ground wires (bare or green) to the ground screw, then connect the white wires and the black and/or blue wires. The black and blue wires are the hot wires for the motor and the light. Connect the wires with a plastic screw on wire nuts and, if necessary, wrap electrical tape around the wire nut and wires in a clockwise direction. Gently push the wires back into the electrical ceiling box to the extent possible. With the ceiling fan assembly wired up, the next step is to remove the fan motor assembly from its temporary hook and place it onto the mounting bolts of the mounting bracket attached to the ceiling box. Then fasten the nuts to the bolts finger tight to hold the fan and bracket in place. Tighten the nuts snugly with a 3/8" drive ratchet and socket (socket size appropriate to ​the size of the bracket attaching nuts). Once the ceiling fan motor assembly is in place, install the motor housing cover. Depending on your model, there will likely be small attaching screws that fasten the cover to the motor assembly. If those screws are already attached to the motor assembly as in this tutorial, remove them and reinstall them when attaching the cover. Attach the fan blades to their attachment brackets. Then attach the assembled fan blades to the bolt holes in the fan's shaft mounting plate. Attach the bracket that will hold the globe for the fan light using the provided small screws. If necessary thread the pull chains through holes in the bracket to allow ​the use of the pull chains. Install the light bulb(s) and the globe. Most enclosed globes use a screw-on-type glass globe. Turn the power back on at the electrical panel. Check operation of the light switch and local pull chain controls for the fan and/or light. That's it, now relax and cool off!